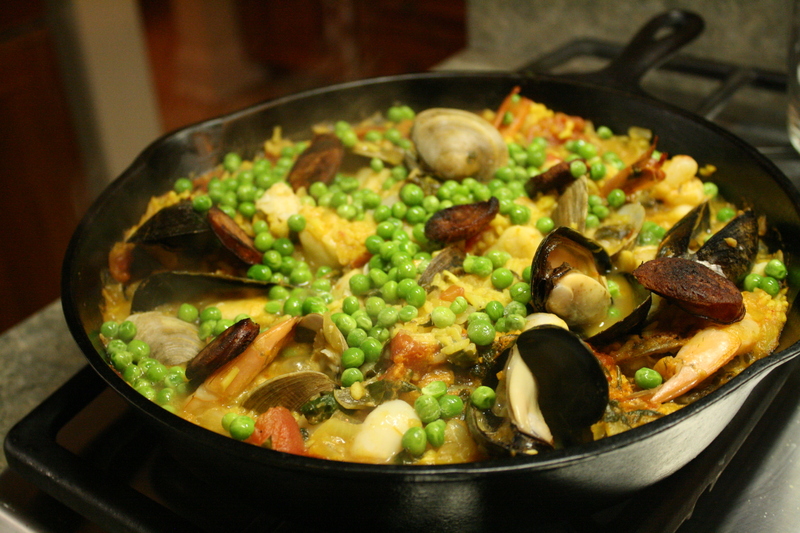 Seafood Paella has become a quiet-stay-at-home New Years Eve tradition for Mark and I. That is if doing it two years in a row qualifies as a tradition. Regardless, we LOVE it. And since I took a couple of photos of this beautiful dish, I thought I would share the recipe with you. It’s one of those recipes that you really can’t mess up and if you experiment with it you will come up with your own unique combination. 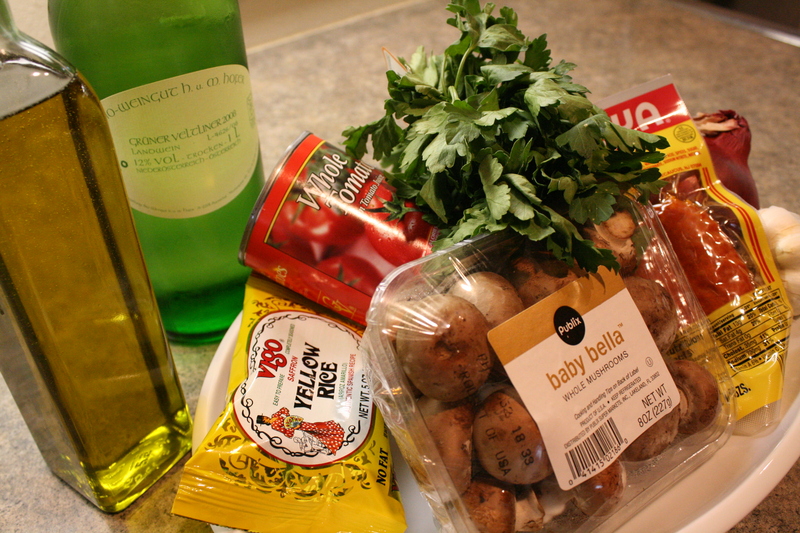 You will find as many Paella recipes as there are ones for lasagna. But here’s how I make it. Vegetable or Chicken Stock ~ replace the amount of water on rice package with the stock. 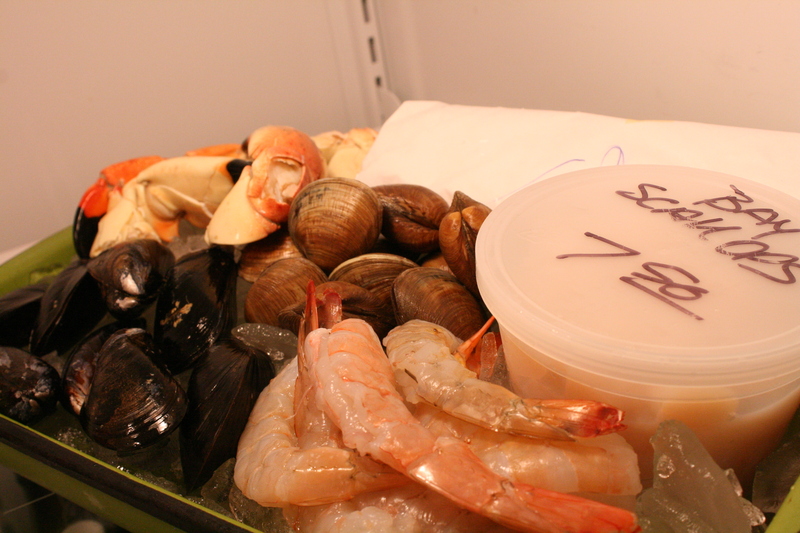 seafood medley ~ make your own combination of shrimp, scallops, mussels (a must for how they make the dish look and taste), clams, firm white fish, and/or stone crab. Way back in the day Paella was a farmer’s dish, made over an open fire with rabbit as the meat, but I prefer chicken or just seafood. Heat some olive oil in a LARGE skillet or paella pan. I use Mom’s well-seasoned cast iron skillet. LOVE IT. Brown the chorizo sausage and remove from pan. Set aside. If adding chicken (I use boneless breasts), this is where you would brown it, remove and set aside. Saute onions, garlic, red/green pepper and mushrooms. Add tomatoes, rice, stock, wine, chorizo and salt & pepper to taste. Add chicken and fish, cook for 5 minutes. Add scallops and shrimp, cook for 5 minutes. Add clams and mussels, cook for (you guessed it) 5 minutes. Sprinkle peas over top, cover and let sit for 5 minutes or so or until the peas are hot. Garnish with a little fresh parsley or cilantro. If at any point you run out of broth add a touch more broth or wine. Mark thinks it’s perfect when the bottom begins to form a crust… not burnt but crispy. I am still working on perfecting that. Feel free to change it up. Make it with just mussels or only shrimp. Like I said it’s one of those recipes you can customize to your tastes. Serve with warm crusty bread and enjoy!